The lensless all-fiber design of the Fiber Fabry-Perot Tunable Filter (FFP-TF) makes it immune to misalignment, environmental sensitivity and extraneous modes. It follows the Airy function so closely that engineers can use the theoretical mathematical model during the design phase. It is thermally stable, vibration and shock resistant, and has a small footprint and fast response times. 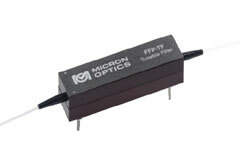 The FFP-TF is ideal for spectrum analysis, optical sensing and monitoring and OCT applications.